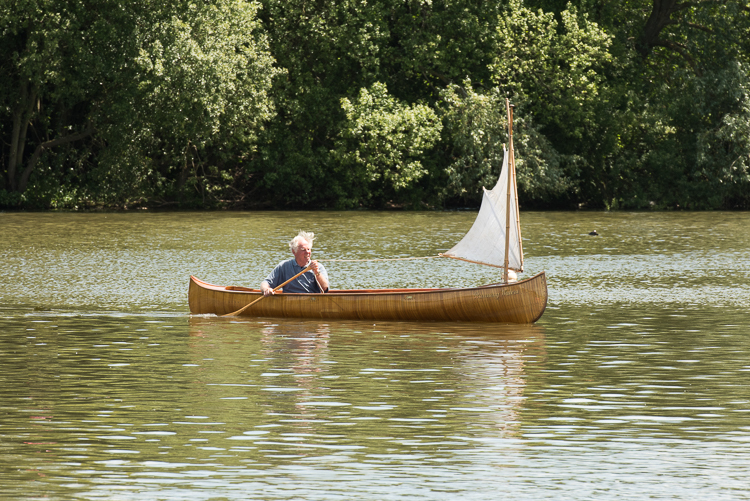 This very beautiful canoe was presented to the Society in 2015 by Mike Pearman, member of the Wooden Canoe Heritage Association. ‘Running Waters’ is a very fine and slightly unusual Canadian Canoe built by Peterborough’s in Canada in 1889. This date comes from the number on the foredeck which is a little indistinct. She is unusual in that the cedar strips from which she is made her are placed round the boat and not along the boat as in many others. The canoe was exported from the US in 1889 to France and sold as a wedding present to an engaged couple. A similar canoe was given to our Queen on her wedding to Prince Philip by the Canadians and this has recently been returned with two others she owned to Canada to the Canoe Museum in Peterborough. Our donors found the canoe, which had never been used, hanging in a garage, black and unloved. They sent it to Mark Stanley who restored its colour, strengthened the inwhale with mahogany and put in a modern stern seat. The seat for the other paddler is midships with a backrest, the paddler being expected to paddle on his knees as per tradition, or sit on the floor, the floor having small boards to cover the strips. ‘Running Waters’ has two modern paddles and a small traditional sail with bamboo spars. The sail was remade as a faithful copy of the original when the previous owner restored the boat. The keel is stepped through a brass ring on the coping.